Average insurance rates for a 2000 Ford F-150 are $884 a year including full coverage. Comprehensive insurance costs an estimated $138, collision insurance costs $142, and liability insurance costs $446. Buying a liability-only policy costs as little as $500 a year, and high-risk insurance costs $1,888 or more. Teenage drivers receive the highest rates at up to $3,626 a year. Rate data is compiled from all 50 U.S. states and averaged for all 2000 Ford F-150 models. Rates are based on a 40-year-old male driver, $500 comprehensive and collision deductibles, and a clean driving record. Remaining premium consists of UM/UIM coverage, Medical/PIP, and policy fees. For the average driver, prices range range from as low as $500 for the bare minimum liability coverage to a much higher rate of $1,888 for a driver that may need high-risk insurance. These differences highlight why anyone shopping for car insurance should compare rates for a targeted area and risk profile, rather than relying on average rates. Locating the cheapest insurance for a Ford F-150 could be an all-consuming task, but you can learn our insurance buying tips to find lower rates. There are more efficient ways to buy insurance so you’re going to learn the quickest way to price shop coverage for your Ford and get the cheapest rates from both online companies and local agents. 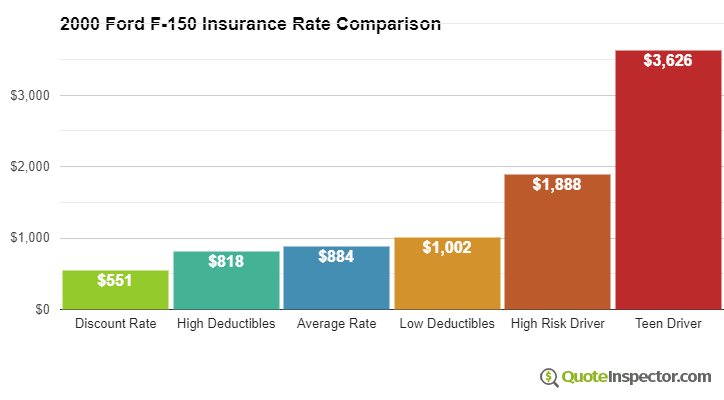 It’s a good idea to take a look at other company’s rates periodically due to the fact that insurance rates are rarely the same from one policy term to another. If you had the lowest rates for F-150 coverage last year you can probably find a better price now. So forget all the misinformation about insurance because it’s time to teach you the quickest way to save on insurance. Shopping for lower car insurance rates can be a lot of work if you don’t utilize the most efficient way. You could spend the better part of a day talking to agents in your area, or you can utilize the web to maximize your effort. The majority of car insurance companies participate in an industry program that allows shoppers to send in one quote, and each participating company can provide price quotes based on the submitted data. This system prevents you from having to do quote requests to every company. To find out what other companies charge for 2000 Ford F-150 insurance click to open in new window. The single downside to doing it this way is that consumers can’t choose the companies to get pricing from. So if you want to choose specific insurance companies for rate comparison, we put together a list of companies who write car insurance in your area. Click to view list. It doesn’t matter which method you choose, just double check that you are using apples-to-apples coverage information for every quote you compare. If you enter differing limits then you won’t be able to truly determine the lowest rate. Car insurance is not cheap, but there could be available discounts that can drop the cost substantially. Certain discounts will be triggered automatically when you complete an application, but lesser-known reductions have to be specially asked for before they will apply. If you don’t get every credit available, you’re paying more than you need to. Air Bag Discount – Vehicles equipped with air bags or motorized seat belts may earn rate discounts of 20% or more. Employee of Federal Government – Employees or retirees of the government can save as much as 8% for F-150 coverage with a few insurance companies. Multi-policy Discount – If you have multiple policies with one insurance company you could get a discount of approximately 10% to 15%. Safety Course Discount – Completing a defensive driving course could save 5% or more if you qualify. Payment Discounts – If you pay your entire premium ahead of time rather than paying monthly you could save 5% or more. No Charge for an Accident – Some insurance companies will forgive one accident before raising your premiums if your claims history is clear prior to the accident. Anti-theft Discount – Vehicles with anti-theft systems can help prevent theft and therefore earn up to a 10% discount. Consumers should know that most of the big mark downs will not be given the whole policy. The majority will only reduce the price of certain insurance coverages like liability, collision or medical payments. So even though they make it sound like you can get free auto insurance, you won’t be that lucky. But all discounts will cut the cost of coverage. Check with each company how you can save money. Some discounts might not apply everywhere. Consumers need to have an understanding of the factors that help determine the rates you pay for auto insurance. Understanding what impacts premium levels empowers consumers to make smart changes that can help you get better auto insurance rates. Claim-free discounts can add up – If you are a frequent claim filer, you can definitely plan on either a policy non-renewal or much higher rates. Insurance companies provide lower rates to drivers who are claim-free. Auto insurance is meant to be used in the event of major claims that would cause financial hardship. Optional equipment can affect rates – Owning a car with a theft deterrent system can help bring down rates. Anti-theft devices such as tamper alarm systems, vehicle immobilizer technology and General Motors OnStar can help prevent your car from being stolen. Never allow your policy to lapse – Driving your car without having proper coverage is against the law and you will pay a penalty because you let your coverage have a gap. Not only will you pay more, getting caught without coverage will get you a hefty fine and possibly a revoked license. Add-on coverages can add up – There are a lot of add-on coverages that you can get tricked into buying on your F-150 policy. Insurance for personal injury protection, accidental death and motor club memberships are examples of these. These may sound like a good investment initially, but if you don’t need them eliminate the coverages to reduce your premium. When buying proper insurance coverage, there isn’t really a one size fits all plan. Everyone’s situation is unique. Here are some questions about coverages that may help highlight whether you might need professional guidance. What is the ISO rating for a 2000 Ford F-150? If you can’t answer these questions but you think they might apply to your situation, then you may want to think about talking to an insurance agent. If you want to speak to an agent in your area, simply complete this short form. It is quick, free and can help protect your family. Consumers can’t ignore all the ads for the lowest price auto insurance by Progressive, Allstate and GEICO. All the ads make an identical promise that you’ll save big if you move to their company. All the different companies can use profiling for the right customer that earns them a profit. For instance, a desirable insured might be profiled as between the ages of 40 and 55, a clean driving record, and drives less than 10,000 miles a year. Any driver that hits that “sweet spot” will qualify for the lowest rates and therefore will save quite a bit of money when switching. Drivers who don’t measure up to the “perfect” profile will be charged higher prices and this can result in the customer not buying. Company advertisements say “customers that switch” but not “drivers who get quotes” save that much money. That’s the way companies can truthfully make the claims of big savings. That is why it is so important to compare many company’s rates. It is impossible to predict which insurance company will give you the biggest savings on Ford F-150 insurance. Understanding the coverages of insurance can help you determine appropriate coverage and proper limits and deductibles. The terms used in a policy can be confusing and even agents have difficulty translating policy wording. Uninsured or underinsured coverage – Your UM/UIM coverage gives you protection when the “other guys” do not carry enough liability coverage. It can pay for injuries to you and your family as well as damage to your 2000 Ford F-150. Due to the fact that many drivers only purchase the least amount of liability that is required, it doesn’t take a major accident to exceed their coverage limits. That’s why carrying high Uninsured/Underinsured Motorist coverage is a good idea. Most of the time these coverages are set the same as your liablity limits. Liability – This protects you from injuries or damage you cause to people or other property in an accident. This insurance protects YOU from legal claims by others. Liability doesn’t cover your own vehicle damage or injuries. It consists of three limits, bodily injury for each person injured, bodily injury for the entire accident and a property damage limit. Your policy might show liability limits of 50/100/50 that translate to a limit of $50,000 per injured person, $100,000 for the entire accident, and a total limit of $50,000 for damage to vehicles and property. Another option is one limit called combined single limit (CSL) which combines the three limits into one amount without having the split limit caps. Liability coverage pays for claims such as medical services, bail bonds and medical expenses. How much coverage you buy is a personal decision, but you should buy as large an amount as possible. Collision coverage – Collision insurance covers damage to your F-150 from colliding with an object or car. You will need to pay your deductible then your collision coverage will kick in. Collision coverage protects against things like crashing into a building, backing into a parked car, crashing into a ditch, rolling your car and scraping a guard rail. Collision is rather expensive coverage, so consider removing coverage from older vehicles. Drivers also have the option to bump up the deductible to save money on collision insurance. Comprehensive protection – Comprehensive insurance coverage covers damage OTHER than collision with another vehicle or object. You first must pay your deductible and then insurance will cover the rest of the damage. Comprehensive insurance covers claims such as hail damage, damage from flooding, a broken windshield and fire damage. The highest amount a insurance company will pay at claim time is the ACV or actual cash value, so if the vehicle is not worth much consider dropping full coverage. We just covered many ideas to get a better price on 2000 Ford F-150 insurance. The key concept to understand is the more companies you get rates for, the better your comparison will be. You may be surprised to find that the lowest rates come from the least-expected company. As you shop your coverage around, it’s very important that you do not skimp on coverage in order to save money. There are a lot of situations where consumers will sacrifice liability limits or collision coverage only to discover later they didn’t purchase enough coverage. The proper strategy is to buy a smart amount of coverage for the lowest price while not skimping on critical coverages. Consumers change insurance companies for any number of reasons including denial of a claim, delays in paying claims, an unsatisfactory settlement offer or not issuing a premium refund. Whatever your reason, choosing a new company can be less work than you think.